Forging(Hada): Forging Hada is supreme fine and uniform Ko-Itame in general and observe minute sprinkled sand impression to cover with thick Nie sparkling hard metal granules "Ji-nie" on Hira-ji surface and darkish precise lines of Nie so called "CHIKEI" activity that wells out from steel. The surface creates an atmosphere of lively sparkling impression so called Konuka-hada 小糠肌. Temper(Hamon): Hamon is fine Nie hard metal granules base, shallow undulating Notare line where deep sparkling hard metal granules "Nie" accumulates on the temper that grows in a belt. The interior of temper is filled with mist-like crystallize area deeply. Upper the blade deeper and brighter the Nie where generates Ni-ju-ha (double temper) boundary line. The entire temper gives off the most brilliant flash among the other works. Temper of tip(Boshi): Temper of boshi forms straight and medium circle turns back deeply. Tang(Nakago): Nakago is UBU original, bottom heel shape is V-shape "Kengyo". One original peg hole of Mekugiana. Slightly slanting right filemarks. Back ridge of Nakago is flat. The signature in front is twelve character that starts from the living place Hizen-koku-ju 肥前国住, an official district title of Ōmi-daijo 近江大掾, name of clan Fujiwara 藤原 and the smith name TADAHIRO 忠廣. The 2nd generation TADAHIRO 忠廣 was born in Keicho 19 (1614) as the first son by a mistress of 1st generation Hizen-koku TADAYOSHI 肥前国忠吉. His initial name was Hashimoto Heisakuro 橋本平作郎, later had succeeded to his father's name of Shinzaemon 新左衛門. He excelled in as a superior sword maker since teen age to play a ghost-maker on behalf of his father in later ages. He had succeeded major TADAHIRO 2nd generation in Kanei 9, (1632) when he was as young as 19 years old. He intended not to succeed his father's smith name TADAYOSHI 忠吉 for the sake of preserving appearances that he was not a legitimate child of TADAYOSHI. Passed away in Genroku 6, (1693), was 80 years old. His legitimate child 3rd generation succeeded to the initial name of TADAYOSHI 忠吉 when he enjoyed the Mutsu daijo 陸奥大掾 title in Manji 3 (1660), was 24 years old. 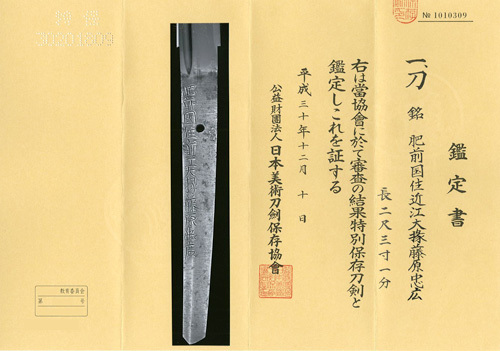 The subject artisan TADAHIRO 2nd generation established and developed the puperior high standard quality of sword making for the major Hizen TADAYOSHI school and had laid the foundations for the later generations until 9th by the end of Edo period. The subject katana holds solidly massive healthy blade with an extended Chu-Kissaki. Most superior forging method using top quality fine steel so called "Tamahagane" generates precisely fine Ko-Itame with most supreme sparkling Ji-nie glitter that generates superior Chikei darkish Nie lines activity. The forging scene as the saying looks like a cutting section of Japanese pear "Nashiji-hada". Nakago hold an excellent taste of patina, clear very-slight slanting right filemarks and vigorous style chisel of inscription from 17th C.
Gold foiled single layer Habaki collar, Preserved in a Shira-Saya plain wood mounting. Recent polish/Condition scale: excellent (using a scale of mint-excellent-very good-good-fair-poor).